Seatrax, a leading offshore crane manufacturer, chose Metalphoto photosensitive anodized aluminum for extreme durability and fast turnaround on permanent labels and markings. 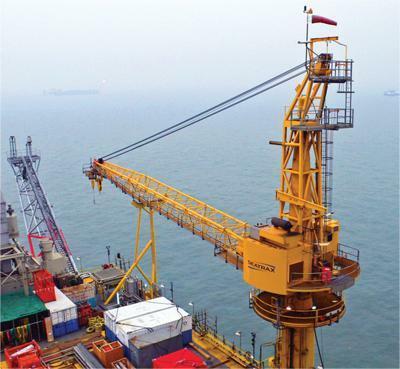 For more than 25 years, Seatrax has manufactured offshore pedestal-mounted cranes that operate in extremely harsh conditions. The cranes and their components must withstand sunlight degradation, salt-spray corrosion, abrasion and hydraulic fluid exposure. The American Petroleum Institute (API) requires that all crane control operations and functions be clearly marked and easily visible by the operator. This means all labels and markings must be readable after years of usage and exposure to the environment. Fading, corrosion and abrasion threaten the readability of identification items, impede safe operation, cost companies downtime and lead to regulatory fines. Many equipment manufacturers use etched and filled stainless steel for component labels and markings on cranes. However, Seatrax found stainless steel to have several limitations; namely high cost, long lead times and limited availability. Although etched and filled stainless steel is historically used to label components, Seatrax questioned stainless steel because of its high cost and long lead times. With one new crane being produced each week, the near real-time availability of durable, customized component labels, load charts and operator control panels is critical to Seatrax production operations. Seatrax experienced the perfect storm of identification issues: extreme operating conditions and short lead times; all with customized graphics for each crane project. Seatrax found Metalphoto photosensitive anodized aluminum to have similar or better durability characteristics than stainless steel, with less cost and quicker turnaround times. According to Project Engineer Max Supkis, "Every single crane has unique sets of panels and having to wait and pay for the stainless is inconvenient and extremely expensive." The primary reason Seatrax specified Metalphoto is its durability - specifically its ability to survive sustained exposure to sunlight/UV, salt-spray, abrasion, hydraulic fluids and solvent cleaners. Since its invention in 1958, Metalphoto has been certified for use by the Norwegian Marine Technology Research Institute (Marintek), National Oilwell Varco, the United States Navy and many other commercial, government and military authorities. The National Association of Graphic and Product Identification Manufacturers (GPI) Industry Standards and Practices Manual identifies Metalphoto photosensitive anodized aluminum as the most durable printed aluminum substrate available, citing its applicability for extreme environmental conditions and outdoor exposure. Lower Cost: On average, Metalphoto costs approximately 30% less than etched and filled stianless steel. Faster Lead Times: Unlike etching, Metalphoto can be produced on-site, reducing turnaround times to 24 hours or less. Alternatively, a network of qualified Metalphoto converters are available around the world to meet fast turnaround requirements. Easier Customizaton: Metalphoto graphics are easy to customize. Because each crane installation requires unique graphics as well as a variety of material thickness from 0.020" to 0.125", the flexible design properties of Metalphoto are valuable. Exceptional Resolution: Metalphoto affords ultra-high image resolution and contrast; ideal for small font size, detailed drawings or barcodes. Reduced Environmental Impact: Regulations are making it more and more difficult to locate acid etchers. Metalphoto is an environmentally sustainable process that, when run properly, can have minimal environmental impact. Because of these benefits, Seatrax trusts Metalphoto for durable labels, load charts and operator control panels on their offshore cranes. For more than 25 years, Seatrax, Inc. has supplied the marine industry with offshore cranes configured for numerous applications and engineered to exacting specifications. Known for its cost-effective, high quality and easily maintained offshore cranes, Seatrax has locations worldwide, including Texas, Louisiana and the United Kingdom. For more information, call 713.896.6500, or visit www.seatrax.com.